The books cover a variety of genres and styles e.g. fiction, non-fiction, poetry, newspaper reports, etc. 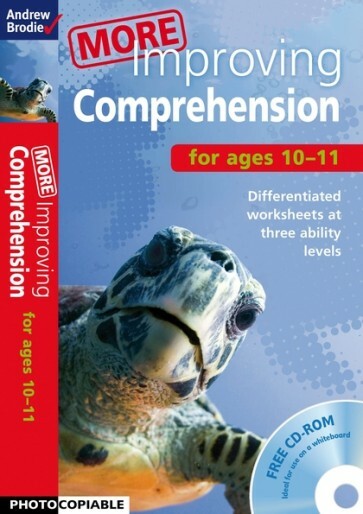 Each book in this series features 15 comprehension passages. Each passage is accompanied by three differentiated comprehension worksheets - one sheet aimed at lower ability pupils, one aimed at the middle range and one for higher ability. It is envisaged that teachers may well end up using two of the three worksheets with each child as progress is made. The books cover a variety of genres and styles e.g. fiction, non-fiction, poetry, newspaper reports, etc. Some passages are taken from existing literature by well-known authors and some are original pieces written by the authors. The carefully worded questions include those with obvious answers to provide practice in writing clear, well-punctuated sentences, and those with less obvious answers so that higher ability pupils will need to ‘read between the lines'. Once completed the worksheets will also provide evidence for teachers when monitoring pupils' progress and assessing their level. The series addresses strands 7 and 8 of the new Primary Framework for literacy, which refer to understanding, interpreting, engaging with and responding to texts, and also strands 11 and 12, which are concerned with sentence structure, punctuation and presentation. Andrew Brodie has extensive experience as a writer of educational materials. He was a teacher for many year and a headteacher over a period of 12 years. He still teaches on a regular basis. Jan Brodie, consultant for the series, is a special needs coordinator in a primary school. She has experience and a range of qualifications in special needs teaching, including the teaching of dyslexic children.